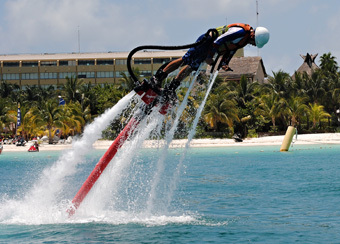 Flyboard Cancun & Riviera Maya! Soar 33 feet above the lagoon with our Personal Watercraft. Easy to use and safe for beginners. Minimum age 18 years. For flyers 16 or 17 years old, a parent or guardian must sign a waiver. Flyer Height range: 5 feet 0 to 6 feet 6 inches tall. Maximum Waist: 46 inches. Refunds will only be given if inclement weather and you must go to the check in to recieve your refund at time of tour. You must be a good swimmer and comfortable with your head underwater. You should not have a fear of heights. Pack for this tour: Swimsuit, towel, t-shirt or jacket. We offer wetsuits & water shoes to rent or you can bring your own. You do not have to be strong to fly, but balance helps! It only takes a few minutes to learn how to fly. Not recommended for pregnant women, persons with any cardiac condition or recent major surgeries.